From Vejle Hospital (K.S., N.A. ); Institute of Molecular Medicine (K.S., M.T.M., N.A. ), University of Southern Denmark; Odense University Hospital (S.R.L., M.T., K.B., T.J.S., C.G., J.G., S.T.L. ), Denmark; Clinical and Experimental Multiple Sclerosis Research Center and NeuroCure Clinical Research Center (F.P. ), Charité-Universitätsmedizin Berlin; Experimental and Clinical Research Center (F.P. ), Max Delbrueck Center for Molecular Medicine and Charité-Universitätsmedizin Berlin, Germany; and University of Michigan Medical School (T.J.S. ), Ann Arbor. In 2002, a 64-year-old man with no history of CNS diseases developed sudden bilateral vision loss and constricted visual fields. Visual acuity was 1/36 and 6/24 in the right and left eye, respectively. Bilateral optic disc edema, greater in the right eye, was noted. Intraocular and intracranial pressures were normal. The neurologic examination, brain MRI, and CSF were normal except for the presence of oligoclonal bands in CSF. He did not receive any treatment. After 3 months, atrophy of the optic head and visual loss (2/36) of the right eye was apparent; the left eye was normal. AQP4-IgG was not determined at disease onset. Two years before the onset of optic neuritis, the patient had undergone surgical thyroidectomy and radioactive iodine ablation for an aggressive oncocytic cancer of the thyroid (follicular type). No evidence of metastatic disease was detected by whole-body MRI. The patient was negative for serum antithyroglobulin antibodies and antithyroid peroxidase antibodies. In 2006, recurrent dyspepsia occurred. A gastroscopy demonstrated an ulcerating jejunal tumor, which was surgically removed and diagnosed as adenocarcinoma. Serum AQP4-IgG, anti-Ma2/TA, antitransglutaminase, and antinuclear antibodies were detectable in 2010. Brain MRI was normal and whole-body MRI remained negative for metastatic disease. Three years later (2013), the patient died of disseminated adenocarcinoma in the retroperitoneum, lymph nodes, and gastrointestinal tract. No autopsy was performed. Potentially deleterious germline mutations such as RET, TP53, and the mismatch repair genes MLH1, MSH2, MSH2, and PMS2 were investigated, but none was identified. Immunohistochemical staining for AQP4 in the paraffin-embedded neoplastic thyroid tissue (3 μm) and the jejunum was performed after antigen retrieval, with primary rabbit anti-AQP-4 antibody, dilution 1:400 (Alomone Labs, Jerusalem, Israel), and counterstaining with toluidine blue. Staining of the thyroid cancer revealed high-level expression of AQP4 in multifocal areas (figure). There was no AQP4 expression in the neoplastic tissue from the jejunum (not shown). Micrographs show immunohistochemistry performed on formalin-fixed paraffin-embedded sections of the follicular carcinoma, thin-sectioned and stained for AQP4 and toluidine blue (A, C, D). (A) A sharp border between the neoplastic thyroid tissue (left) and normal thyroid tissue parenchyma (right); (B) (insert) shows negative control. (C) Multifocal high-level expression of AQP4 in the neoplastic thyroid cells, which is distinctly different from the normal thyroid tissue. (D) Magnified view of B shows AQP4 immunoreactivity predominately in the cell membrane (arrowheads). Scale bars = 200 μm (A, B), 100 μm (C), 20 μm (D). We report the clinical and laboratory investigations of a patient with NMOSD who developed 2 apparently unrelated malignancies over a 6-year period. 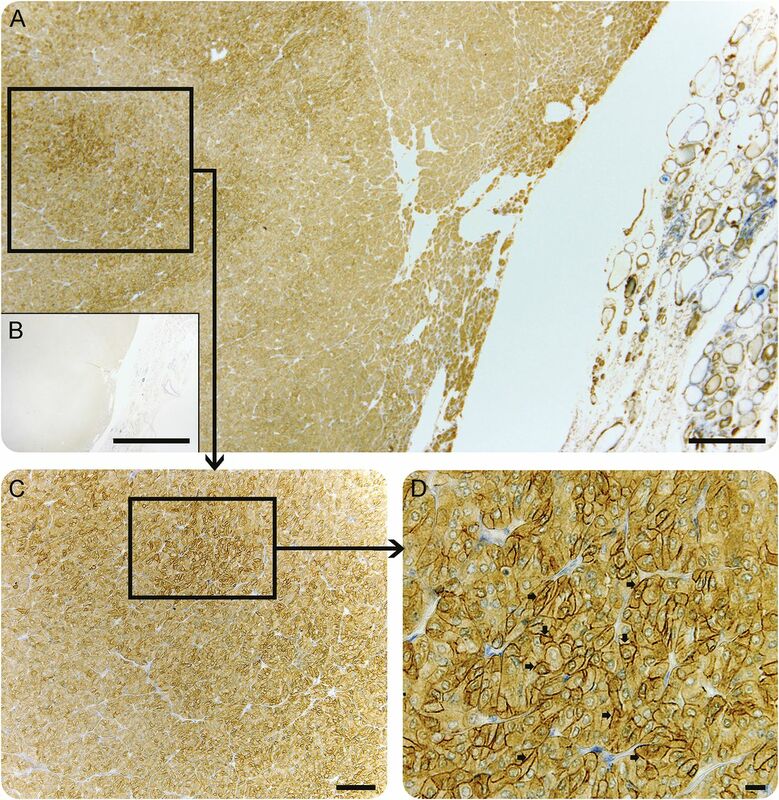 AQP4 was expressed in thyroid neoplastic tissue and later AQP4-IgG was detectable in serum. These findings suggest that autoimmunity against tumor-expressed AQP4 potentially elicited development of NMOSD, extending the spectrum of paraneoplastic AQP4 autoimmunity.4 Reportedly, 5% of patients with AQP4-IgG seropositive NMOSD had a history of neoplastic disease.4 Furthermore, 27% of individuals undergoing investigation for PNS were found to have detectable AQP4-IgG.4 Congruent with the current case, high AQP4 antigen expression in neoplastic tumor cells has been demonstrated in PNS.5 Outside the CNS, AQP4 is normally expressed at low levels in basolateral plasma membranes of epithelia in a number of tissues.2,6 It has been suggested that the differential expression of AQP4 may reflect the biological nature of neoplastic thyroid cells.6 In this case, the thyroid tumor was characterized as oncocytic carcinoma with high expression of AQP4, which appeared in a multifocal pattern (figure). In addition to serum AQP4 IgG positivity, anti-Ma2/TA was also detected. This antibody is viewed as an indicator of limbic encephalitis, of which the patient did not manifest suggestive symptoms. However, onconeural antibodies may be detected in individuals without neurologic symptoms.7 Seropositivity for AQP4-IgG 8 years after onset of optic neuritis suggests that the patient's blood–brain barrier remained intact, thus restricting entry of these antibodies into the CNS. This case of NMOSD with AQP4-IgG seropositivity in the context of thyroid cancer expressing high-level AQP4 expands the spectrum of paraneoplastic autoimmunity targeting this antigen. Acknowledgment: The authors thank The Lundbeck Foundation, The Region of Southern Denmark, and The University of Southern Denmark for support; and the Owens group for discussion. F.P. is supported by Bundesministerium für Bildung und Forschung (Competence Network Multiple Sclerosis). Author contributions: K. Soelberg: study concept and design, acquisition of data, interpretation of results, and writing of manuscript. S.R. Larsen: acquisition of data, revising manuscript, and approving final version. MT. Moerch: acquisition of data, revising manuscript, and approving final version. C. Godballe: interpretation of result, revising manuscript, and approving final version. M. Thomassen: acquisition of data, revising manuscript, and approving final version. K. Brusgaard: acquisition of data, revising manuscript, and approving final version. F. Paul: interpretation of result, revising manuscript, and approving final version. T.J. Smith: interpretation of result, revising manuscript, and approving final version. J. Grauslund: interpretation of result, revising manuscript, and approving final version. S.T. Lillevang: acquisition of data, determination of aquaporin-4 antibodies and other autoantibodies, revising manuscript, and approving final version. N. Asgari: study concept and design, acquisition of data, interpretation of result, revising manuscript, and approving final version, study supervisor. Study funding: Supported by the Region of Southern Denmark and The University of Southern Denmark. Disclosure: K. Soelberg received research support from The Region of Southern Denmark and the University of Southern Denmark. S.R. Larsen reports no disclosures. M.T. Moerch received research support from Lundbeck Foundation. C. Godballe serves on the editorial board for European Archives of Otolaryngology and Acta Oncologica. M. Thomassen reports no disclosures. K. Brusgaard served as an editor for PlosOne and Lipidology. F. Paul received speaker honoraria and travel grants from Bayer, Novartis, Biogen Idec, Teva, Sanofi-Aventis/Genzyme, Merck Serono, Alexion, Chugai, MedImmune, and Shite; was on the study steering committee for Novartis and MedImmune; is an Associate Editor for PlosOne and Neurology®: Neuroimmunology & Neuroinflammation; has consulted for SanofiGenzyme, BiogenIdec, MedImmune, Shire, and Alexion; received research support from Bayer, Novartis, Biogen Idec, Teva, Sanofi-Aventis/Genzyme, Alexion, Merck Serono, German Research Council, Werth Stiftung of the City of Cologne, German Ministry of Education and Research (BMBF Competence Network Multiple Sclerosis), Arthur Arnstein Stiftung Berlin, EU FP7 Framework Program, Arthur Arnstein Foundation Berlin, Guthy Jackson Charitable Foundation, and the US National Multiple Sclerosis Society. T.J. Smith received research support from NIH, Bell Charitable Foundation, RPB Foundation, and Guthy-Jackson Foundation. J. Grauslund serves as editor for ACTA Ophthalmologica. S.T. Lillevang reports no disclosures. N. Asgari received research support from The Vejle Hospital Research Fund of the Region of Southern Denmark, Lundbeck Research Foundation, The University of Southern Denmark. Go to Neurology.org/nn for full disclosure forms. The Article Processing Charge was paid by the authors.
. Update on neurological paraneoplastic syndromes. Curr Opin Oncol 2015;27:489–495.
. Cerebrospinal fluid aquaporin-4-immunoglobulin G disrupts blood brain barrier. Ann Clin Transl Neurol 2015;2:857–863. Longitudinally extensive transverse myelitis with AQP4 antibodies revealing ovarian teratoma. J Neuroimmunol 2013;263:145–147. Differential expression of aquaporins and its diagnostic utility in thyroid cancer. PLoS One 2012;7:e40770.
. Paraneoplastic syndromes: an approach to diagnosis and treatment. Mayo Clin Proc 2010;85:838–854.